Included on this Stone Tone release are covers of songs by Chess Records legends like Howlin’ Wolf and Willie Dixon, as well as tracks by a pair of former Muddy Waters harmonica-playing sidemen in Little Walter and Junior Wells. Big Apple Blues also tosses in a couple of Big Easy classics by Dave Bartholomew, including the Fats Domino staple “Whole Lotta Lovin,’” and songs by Big Joe Turner and Paul Butterfield, as well. That gives this warm vibrancy to Brooklyn Blues, which smartly mimics the densely spacious sound of those original masters. 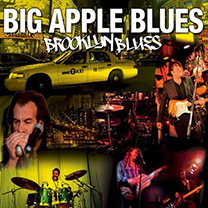 You quickly sense that this group’s high fidelity goes beyond the studio technology; Big Apple Blues displays a lasting faith in the music’s tradition.